I am very thankful to have a dependable vehicle. I received this vehicle in 2017 from my son who owns a used car lot. It seats approximately seven adults comfortably. . . More if children are included. The seats are of a soft plushy fabric. . Second row of seats has a pass-through to the rear seats. The rear seat can be flattened and combined with the rear flat area to make a large storage area. I have not experienced any problems with the vehicle since my son or grandson pick it up regularly to service it. They do all the normal check-up and replace the tires as needed. They also replace the windshield wipers and rear wiper before they get shabby. It is a very comfortable ride and has been very reliable. I have never done a calculation of the mileage but it seems to be very good on fuel usage. The stow and go seating is the best. It is comfortable, nice looking and reliable. What I hate is the annoying noise it makes when I start it. A loud rattle. It is unnerving and annoying because I cannot diagnose it. Makes me worry it is an expensive fix. But it has taken us to the east coast twice and d. C. Once and a lot of other places in between and has never failed us. And we drove it hard! I do like that it is reliable. I would not be afraid to drive this car anywhere. It has over 200k miles now. It is a cusp year car so it uses parts from 2005-2007. It makes it hard. I have had ton of mechanical problems with this vehicle in particular. After the mechanical problems had been rectified, mostly under warranty, it improved and my opinion of the car improved. 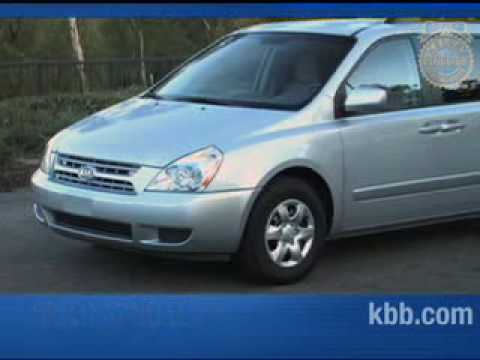 However, I don't thing that I would buy another minivan from Kia simply because of the issues I have had in the past. The van was a lemon and there was something wrong with it a least every month for five years. ON CERTAIN PASSENGER VEHICLES EQUIPPED WITH ADJUSTABLE BRAKE PEDALS, THE STOP LAMP SWITCH WIRING HARNESS MAY BE OUT OF POSITION. AN IMPROPERLY POSITIONED STOP LAMP SWITCH WIRING HARNESS COULD MAKE CONTACT WITH THE U-JOINT ASSEMBLY OF THE STEERING COLUMN. REPEATED CONTACT MAY EVENTUALLY CAUSE THE WIRING HARNESS INSULATION TO WEAR THROUGH LEADING TO CHAFFED WIRES. CHAFFED WIRES COULD CAUSE A SHORT OF THE WIRING HARNESS RESULTING IN THE LOSS OF BRAKE LIGHTS, ENGINE STALLING, OR AN INABILITY TO START THE VEHICLE INCREASING THE RISK OF A CRASH. DEALERS WILL INSPECT THE WIRING HARNESS FOR CHAFFING AND, REPAIR IF NECESSARY. IN ADDITION, THE DEALER WILL SECURE THE WIRING HARNESS AWAY FROM THE U-JOINT ASSEMBLY. THE RECALL IS EXPECTED TO BEGIN BY THE END OF SEPTEMBER 2006. OWNERS MAY CONTACT KIA AT 1-800-333-4542.